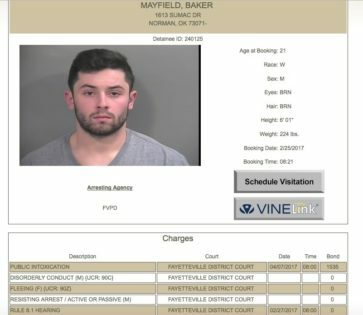 Baker Mayfield, Oklahoma’s star quarterback was arrested last night in Fayetteville, Arkansas and charged with public intoxication, disorderly conduct, fleeing and resisting arrest. The particulars of the incident will be noted elsewhere and his guilt or innocence will follow in the near future. The actions of the university and head coach Bob Stoops toward Mayfield will follow also. With the arrest, those sports fans and non-sports fans that have a hatred toward the University of Oklahoma in any way will make their case for bashing the Sooners, Bob Stoops, Baker Mayfield, and athletes that have cause to show negativity toward college sports in general. If you are of such persuasion, hating OU and such, please comment your concern. first, do you really think a missed start or even a missed couple of series, or for that matter, a missed game, or two, really matters? Baker is either a man or he is not a man. I have to think that he did a knucklehead thing, and that does not have anything to do with age. If Baker is a man, he knows good and well what he did and how he acted is not going to work. All the extra physical punishment, the missed game action, etc, will not make one bit of difference if Baker is such, a knucklehead for life. I don’t believe he is but Johnny M. was and there are some out there that cannot get it, ever. Stoops livid, furious? I don’t think so. It is what it is. For Stoops, if the actions of 18-21 year old men mean everything, he is a sad person. You can do all you can do and it is what it is. For suggesting what Stoops to do with Baker is not really for speculation. Stoops makes almost $300,000 every two weeks, 52 weeks in the year to make decisions like this. Not the first nor the last. As for fans, chill. It is ok to think OU will be good in the future and Mayfield also.